After spending a significant amount of money on a swimming pool, the idea of shelling out even more for a pool house might seem frivolous. After all, the pool is for swimming, and a pool house will, in no way, help you swim. However, what most people don’t take into account is that the pool house isn’t part of the pool; it’s an added feature to your home that offers numerous benefits. As for the cost, a pool house in Lancaster can range from a complex structure with facilities and space for multiple uses to a simple cabana in which you change your clothes. Before we take a look at the benefits of a pool house, it’s important to first understand its basic function: convenience. Most people who owns pools also own a lot of the “things” that go along with them such as goggles, snorkels, rafts, loungers, and so on. Not only can a pool house be a fantastic place to store these items, but it also functions as a convenient place for friends and family to change into their swimwear before enjoying the pool. Think about it: Never again will have to worry about visitors running to the house, leaving a trail of wet footprints behind as they move about your home. In fact, if you choose to invest in a pool house with a bathroom, there’s really no need for anyone to enter your home until they are completely dry. These are the two main functions of a pool house, but these structures also offer other benefits that, when you think about it carefully, add up to a very good reason to invest in one. Also, if you’re thinking about selling your home in the near future, keep in mind that a pool house will always increase the value of your property and allow you to recoup the cost of your investment. 1. What happens to your garden and pool furniture during the winter? If you invest in a pool house in Lancaster, you can use it for off-season storage to contain all of your outdoor patio furniture and accessories. Since you (hopefully) won’t be using the pool in the dead of winter, you can store everything in the pool house until it’s once again needed. 2. If space allows, you can set up a home gym right inside your pool house. Not only will you save space inside your home, you won’t disturb the rest of the family while you’re working out in the wee hours of the morning. If you choose this route, you’ll also be able to enjoy the pool house year-round, a major plus if you’re concerned about the space sitting empty during the cold winter months. 3. If your budget and space allows, why not create a pool house-turned-guest house? Incorporate a bathroom and a bedroom into the pool house, and you now have a very attractive option for overnight guests. Your visitors can live in beautiful, luxurious surroundings right by the pool, and you get to keep your privacy in your own home. 4. You probably use chemicals to clean the pool and balance the water composition. These chemicals can be poisonous and dangerous, and they are best securely stored away in a pool house where they can’t be accidentally ingested or improperly used. This is a huge benefit for families with small children who tend to climb counters and rummage through cabinets. 5. If you own a pool, chances are that you’ll be entertaining people there at some point in time. A pool house allows you to keep the party outside in your backyard rather than inside your home. Since everything is available poolside, guests won’t need to enter your home to use the bathroom or to get food or drinks. The result? A home that stays untouched and dry. Can you imagine your pool house already? Are you sketching ideas and wanting to get started right away? 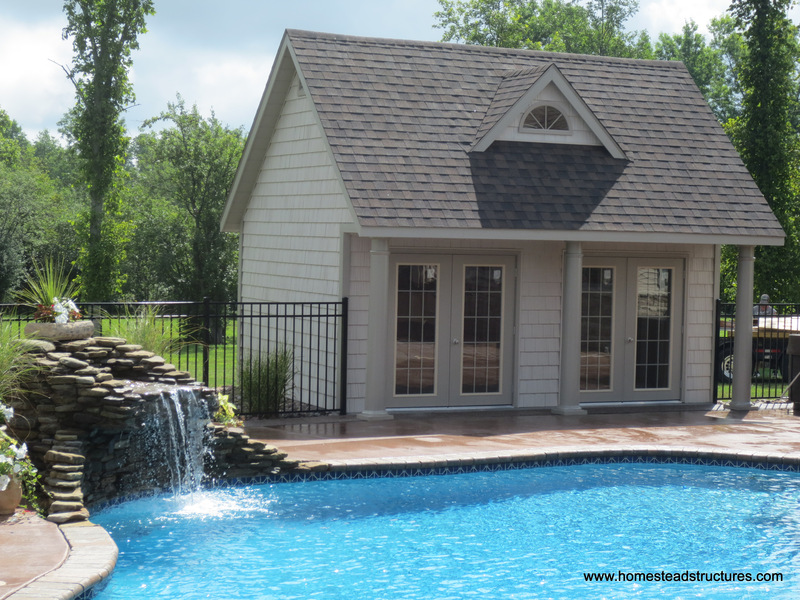 If you’d like to speak with an experienced pool builder in Lancaster PA, contact Homestead Structures today at (877) 272-7252 today for more information about building a custom pool house tailored to meet your needs and your budget.